An eyelid’s flutter from home. I found this in a compilation called Soho Square Six the first time I went to Ireland. I was a college student, and I was achingly homesick and very very happy by turns. Bolger’s words comforted me in exactly the moment I needed them, and I managed to scrounge up enough cash to buy another large book I’d have to tote around and squeeze into my luggage. Ondine, in Morrison’s masterful Tar Baby, one of my favorite examples of Magical Realism. At some point, as a strange child who decided to write the Great American Novel (whatever the hell that even means), I stumbled across the concept of a “Commonplace Book.” And I started sort of keeping one. The things I would include in my Commonplace book pop up in my journals, in notebooks, on slips of paper and via highlighted sections in text books. Many people encourage hand-written Commonplace Books for a myriad of excellent reasons. But my journals have no concordance, and that is unlikely to change. So it’s time to start building a digital one here. Hence the new category and the browsing of countless pages of my own messy scrawl. And now to begin . . . 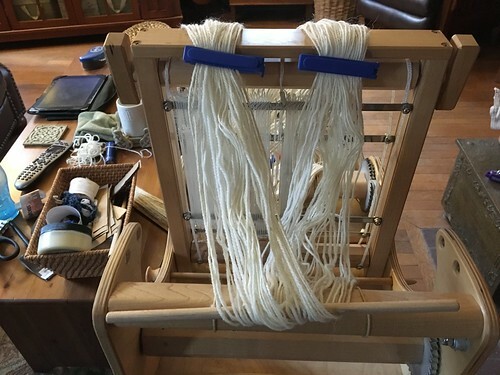 Some friends have asked questions about my favorite loom recently, so I figured an explanatory post was due. 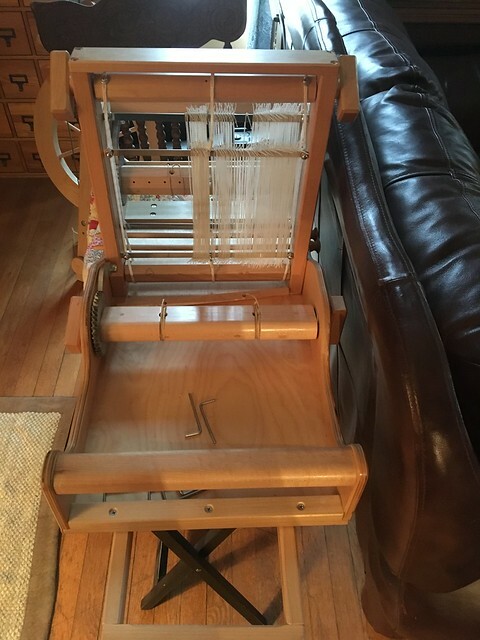 I have a Gilmore Big Wave loom, which I bought several years ago. 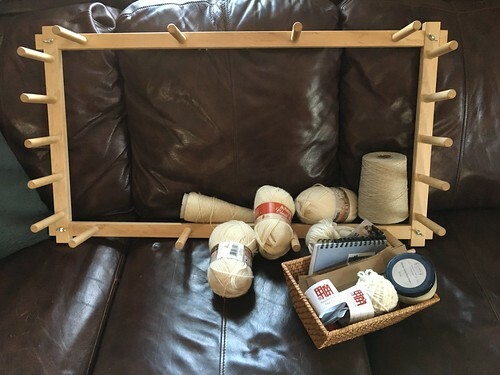 It was significantly more expensive than my previous inkle loom, but in has a number of features that make weaving much easier on my poor achy hands, so I think it was worth every penny. 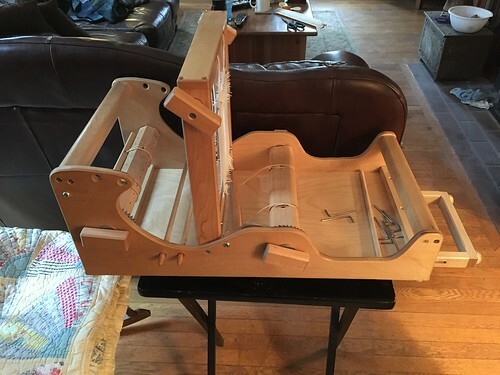 It is structured much like many floor looms, which makes it stronger than most open-sided inkle looms. It has a warp beam and a cloth beam, and both are tensioned via those self-braking gears. It holds beautifully even tention. Those texsolv heddles seem to last forever, but I have extras if they wear out. Using this method to change sheds is much, much easier on my hands than any similar loom I’ve worked on in the past. 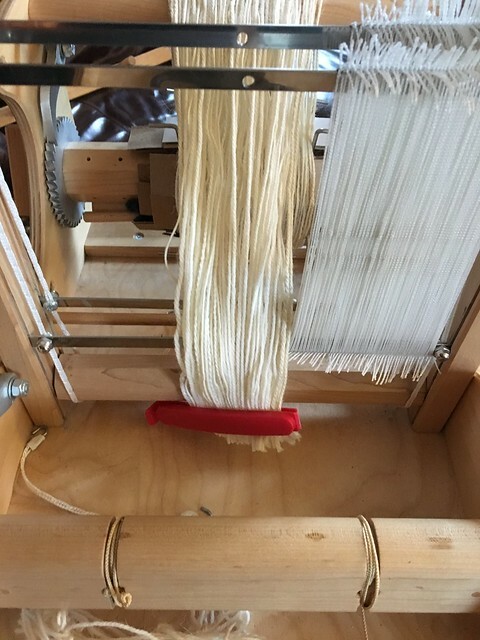 This loom obviously isn’t set up for a continuous warp, so I have to warp on a warping board and transfer the warp to the loom to weave. That allows for a much longer and/or wider warp, so it opens up a lot of possibilities my old loom didn’t offer. To begin a project, I gather supplies and review some notes so I can begin plotting a draft. 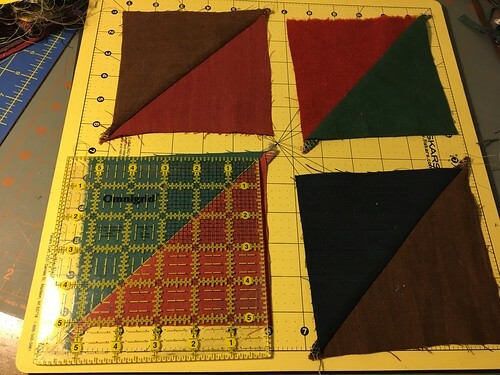 I’m making a tone on tone white belt for a friend, so I plot out some color options in the best light available to me, and then design a warp on the board. Rather than tying the warp, I secure it with some clips. I am going to transfer it to the loom immediately, so I don’t bother chaining the warp. You can see I have the cross clipped in two spots, just in case. This warp will make a band that’s about three inches wide. 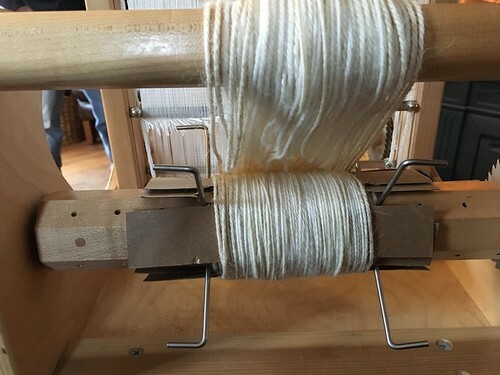 My current habit is to load the warp onto the warp beam and then sley the heddles as if they were a reed, but I am sure you could dress it the opposite way. 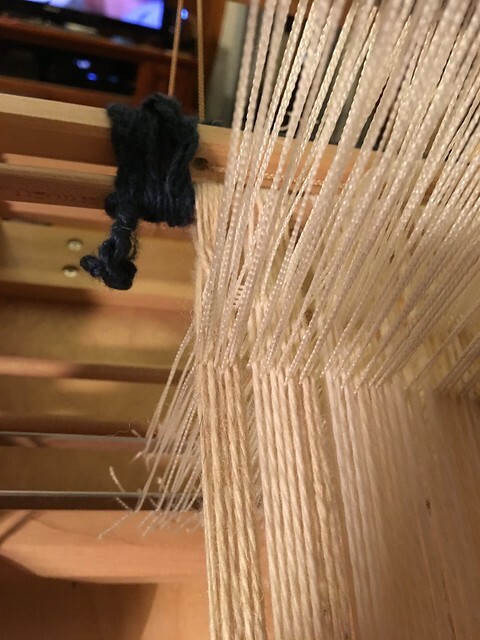 I’ve pulled the warp off the board and just draped it over the heddle tower, separating out the two arms of the warp cross. 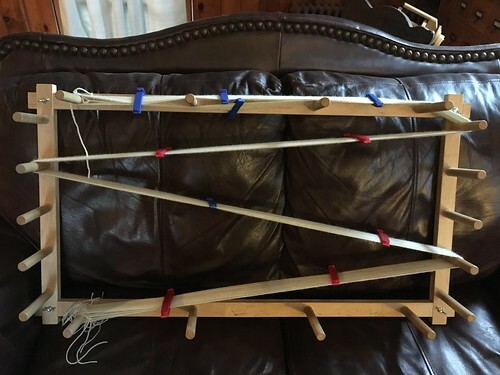 The loom came with two maple dowels to help dress the warp and cloth beams in whichever way you prefer. It also comes with two lease sticks and has holes drilled to use them or store them–I generally only bother with one for these bands. Here, I’ve begun winding the warp onto the warp beam. The loom also comes with these pins that help keep the warp from spreading out too far on the beam and generally allow you to wind on neatly. I’m using some scrap cardboard as warp separators. 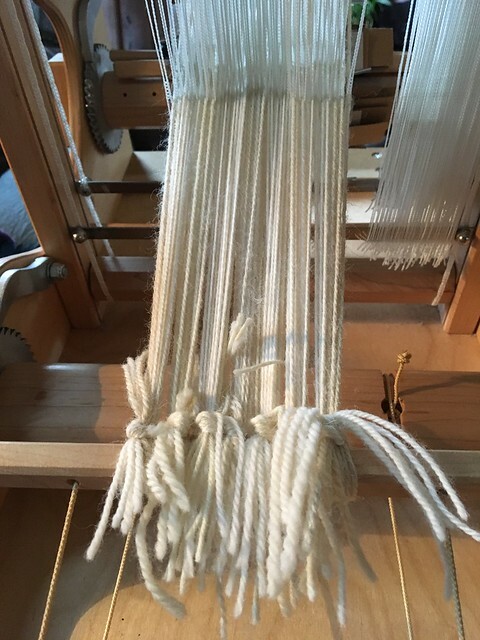 I wind on carefully, combing the warp with my fingers and attempting to maintain even tension as I go. Once the warp beam is dressed, I move to the front of the loom, trim the ends of the warp even, and dress the heddles in whatever pattern I’ve come up with. When I do these patterned white on white bands, good lighting is vital for this task. I thread the heddles and tie off using larks head knots, which is pretty standard. And then I weave until I get too close to the end of the warp for things to work happily. I came across Postcards from Sweden a few years ago, and loved it, and promptly forgot about it. But then a friend made one, and I gave some thought to the ludicrous piles of linen scraps in my studio, and jumped in. I will end up with a different palette, because my scraps tend to be darker or sadder than the colors in the original, but I can accept that. 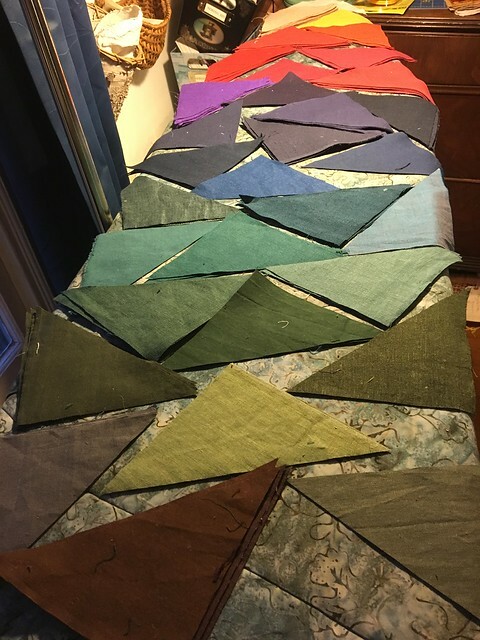 I also reached out to friends to see if they had scraps they wanted to part with, and a couple of people were very generous. I have enough to piece the top without cutting into yardage. 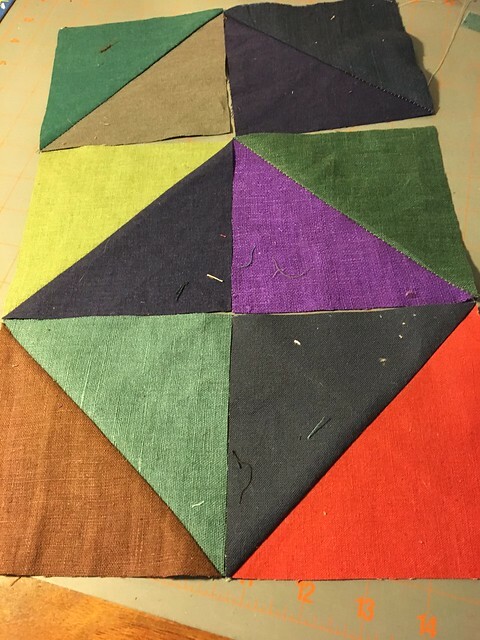 I opted to start with 6″ squares and cut those into half-square triangles, knowing I’d wind up with much smaller blocks once seam allowances and the difficulties of working with linen came into play. 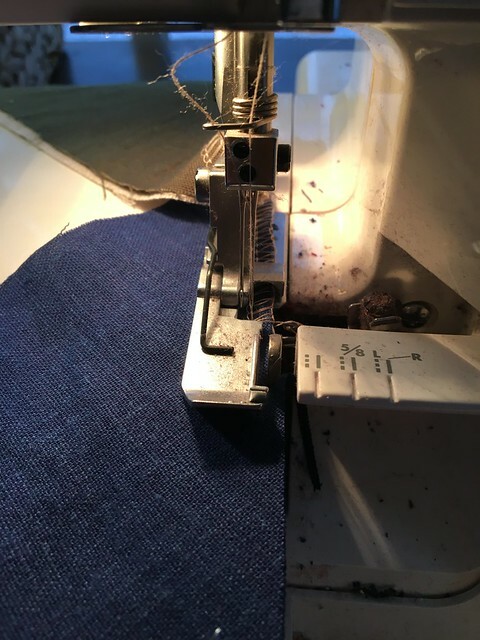 Using linen for quilts requires a lot of seam finishing, so I tend to piece with my serger to keep the whole thing from disintegrating. I build in big seam allowances as well, and try to make up for an increased risk of biasing and stretching when I use garment fabrics. 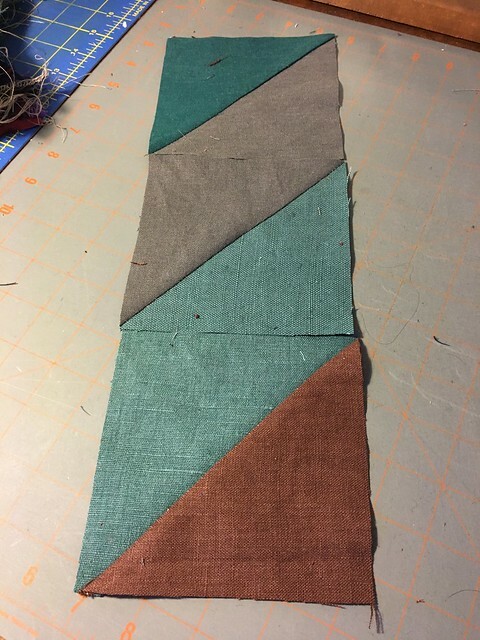 You can see that the serged seam is larger than the standard scant 1/4 inch most quilters use when piecing. That is all damage control, so I work with it. As I piece and press, I am careful not to stretch that biased edge I’m joining. 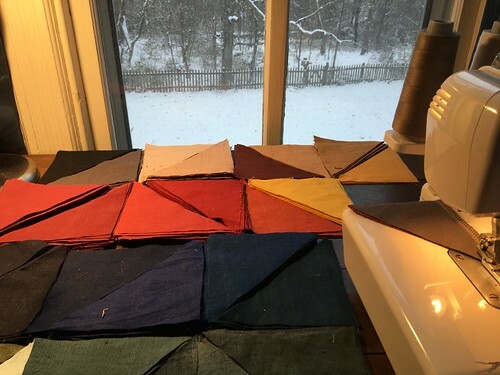 Linen quilts call for lots of pressing, of course, so I tend to save them for the winter when my studio is otherwise cold. I do sometimes also starch or use some other sort of pressing spray to try to make up for the stretch and give of garment fabrics. 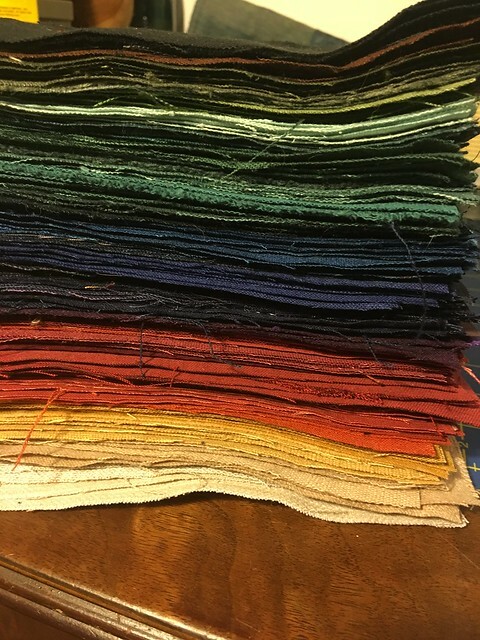 Once I had the fabrics all cut, I set up the stacks and did my best to select pairings randomly. I had to coerce myself to put some colors together that I normally wouldn’t. And then, the trimming. 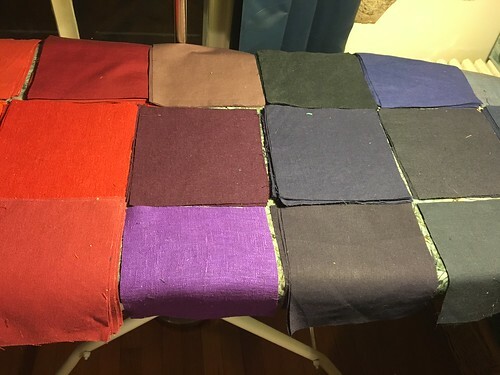 I kid you not about linen’s tricksie ways. 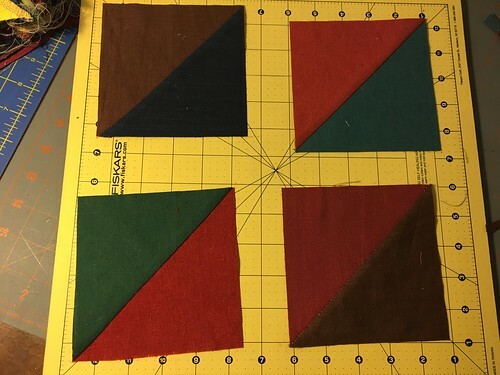 That is a relatively well pieced block, but the looser weave, the biased edges, and the serged seam all come together to cause some oddities. Aggressive trimming is necessary. I opt to do most things as if I’m on a production line, so I turned to a good ruler with a 45 degree mark and a rotating mat. I’m trimming batches of four at a time. If I didn’t plan to start joining blocks soon, I would wait on this. 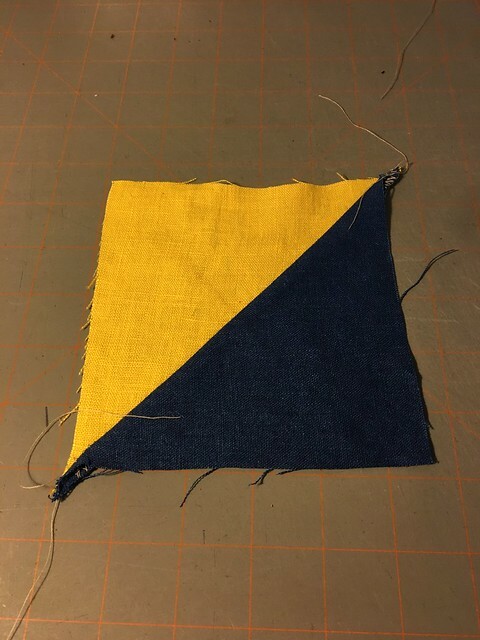 Trimming is taking off those chains of stitches that help make serged seams last, so the trimmed squares are fragile. Now, to play with layout options. I still need to piece 100 or so squares, but I want time to mull over setting in the meantime. I have a lot of deep blues and reds, so I can rely on them for structure if I want it, or I can fight that urge and lean on improvisation for movement. I’m not liking diagonal striping. I will likely haul out the design wall. This was my challenge for the Celtic component of the Bardic Quest at War of the Wings, 2017. Boasts have a particular prominence in Celtic mythology: the most famous is the Song of Amergin, but the boasts in Mac Datho’s Pig are also notable. My Mother Tongue gave it breath. And know what heights I reach. To tear my foes asunder. And rob sleep from his home with a quip. Laughter from your belly on a whim. My knife is sharp–my tongue much sharper. My wits keen and true. My lips speak a spell to capture multitudes. Or a woman’s unbreakable strength. To supplant their masters in the minds of men. Prove your worth. Speak your power. If Bright Brigid blesses you, take your place at my side. And speak not of yourself as “Bard” henceforth. It dawned on me I had never translated this most famous passage from Irish mythology, so I set to work. From Lebor gabála Érenn: The book of the Invasions of Ireland. I worked from the text here. Am gáeth i mmuir. ar domni. Am tond trethan i tír. Am gai i fodb. feras feochtu. Am dé delbas do chind codnu. Coiche nod gleith clochur slébe. Cia dú i llaig funiud grene. Cia beir búar o thig Temrach. Cia dé delbas faebru. a ndind ailsiu. Cáinté im gaí cainte gaithe. Am. I am the wind on the sea–the depths. I am a wave storming the land. I am the roar of the Ocean. Mine are the seven antlers. I am a falcon on a cliff. I am the Sun’s own tear. I am a boar of fury. I am a salmon in a pool. I am a lake in a meadow. I am the Pinnacle of Poetry. I am the flaming word. I am the spear of the spoils– War’s work. I stoke the fire in the head. Who marks the path to the mountain’s peak? Who invokes the ages of the Moon? Who guides the setting sun? Who leads the cattle from Temrach’s abode? Who do Tethra’s Sparkling kine adore? Who hones the sharpest edges, the fortress fosters? Who sings the Spear-Song, the Wind-Song, but I? Mine is the penultimate piece. It was interesting to be recorded. Like many people, I had a hard time getting used to the sound of myself, but I think I’ve now messed with recordings enough now that I do indeed recognize my own voice at a remove. Everyone involved with this project has been an absolute joy to work with. I can’t really fathom how much time and energy Gideon/Steve puts into this project of his, but I’m grateful for the podcast. I love that my poem is included with Bryce’s and Lasair’s. The Fyrdraca is a reproduction ship built in 1979 by the venerable Longship Company and sold to some intrepid kooks in 2003–it made its way to my friend Richard, and he still keeps her afloat after all this time. I’m busy and happy and writing, and hoping some day soon to see her in person again after so many years. No cry pulled me from sleep. then borne beyond foot’s reach. with simpler dreams and stronger hands. What value dappled eyes and nimble hands? to and from my tribes and back again. Cradling them between the two. to call me to the beach. loud enough to know each throat’s own pitch. Krupnik is a Polish spiced honey cordial, which my friend Scot introduced to be ten or fifteen years ago. I learned to make it from my friend Jenny and took to altering the recipe to fit my palate. The method I’ve devised is far from traditional at this point, but produces something less sweet and with a deeper flavor than many krupniks I’ve sampled over the years. The recipe can easily be scaled up or down–we tend to make one huge batch every winter and decant it from an infusion jar as needed. For that reason, we attempt to limit options for mold growth–honey itself does not generally mold–nor does vodka or other high proof liquor. Water and fresh fruit can introduce possibilities for mold growth, so I avoid using them in most instances. I also don’t add the liquor to hot honey, because I don’t want to catch the liquor on fire or aerosolize it. 6-8 1.75 liter bottles of vodka. You could also use white rum or grain alcohol if you prefer. Add the honey to the stock pot and rinse out the honey jars with a small amount of hot water. You want to waste as little honey as possible while also adding as little water as possible to the Krupnik base. Slowly bring the honey mixture up to a simmer, stirring regularly. Continue simmering and stirring the honey mixture until it thickens as the water evaporates and the honey starts to darken. I like to thoroughly caramelize the honey so the finished Krupnik has a deep flavor. Do not allow the honey mixture to boil over. Making honey candy on your stove burners is not ideal. I’ve done it several times, and I do not find the experience enjoyable. Spoon out a small sample of the honey, allow it to cool, and taste it. Adjust your spice mixture if necessary. The hot honey will draw flavors out of the spices quickly, so this is the best time to adjust things. Once you are happy with the amount of caramelization and spice in the honey, remove the pot from the heat, put a lid on it, and allow it to cool completely. Select a good spot to store your krupnik for at least a month. You want it to be out of direct sunlight and kept at a moderate temperature, but you will also want to stir and sample the krupnik regularly while it mellows. When the honey mixture is completely cool, sterilize your infusion jar using your preferred method. Pour the honey mixture from the stock pot into the sterilized infusion jar, using a rubber spatula to get every bit of honey you can into the infusion jar. This will make everything near you sticky unless you are far more dexterous than the average person. Add vodka to the honey, stirring gently to avoid splashing stickiness any further than you already have. Because I made such a large batch, I moved the infusion jar to its storage location before adding the vodka. I don’t start with the full 6-8 large bottles of vodka. For this batch, I added four bottles and let it sit to mellow and will add more later once I get a sense of how the batch is tasting. I don’t want the final product to be too sweet or too thick, but I also don’t want the honey and spices to be overpowered by the vodka. Allow the krupnik to mellow for at least a month, checking it frequently for flavor. If it seems too sweet or thick, add more vodka. If the Krupnik reaches a point where you have enough of a particular flavor, feel free to remove that spice. I’ve strained out cloves after a week or two, removed orange peels after a month, etc. 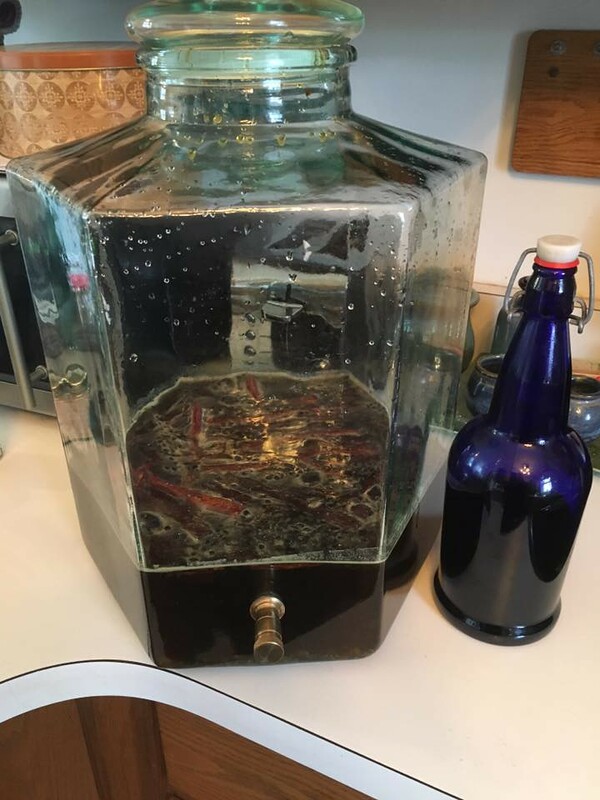 Once the krupnik has the flavor you want, decant it into sterilized swing top bottles and enjoy. This is just the caramelized honey and spices–you can see how dark the honey is. Crazy Lanea Copyright © 2019. All Rights Reserved.